Daily nourishing cream for beautiful faces. 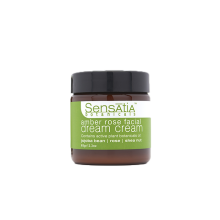 Blissful; subtly euphoric, full-bodied, seductive & extremely enticing; Sensatia’s amber rose facial dream cream is the richest, most sensually-addicting facial moisturizer on the planet. Natural amber essence is sinfully-coupled with pure rose absolute resulting in complete rapture. Water (Aqua), Butyrospermum Parkii (Shea) Butter, Cetearyl Glucoside & Sorbitan Olivate, Olea Europaea (Olive) Fruit Oil, Aleurites Moluccana (Kukui) Nut Oil, Cera Alba (Beeswax), Simmondsia Chinensis (Jojoba) Seed Oil, Parfum (Natural Amber Essence Blend), Triticum Vulgare (Wheat) Germ Oil, Zea Mays (Corn) Starch, Sodium Citrate, Benzyl Alcohol & Benzoic Acid & Dehydroacetic Acid, Bixa Orellana (Annatto) Seed Oil, Tocopherol (Vitamin E), Xanthomonas Campestris (Xanthan) Gum, Citric Acid, Rosa Damascena (Rose) Extract, Hippophae Rhamnoides (Seabuckthorn) Oil, Rosmarinus Officinalis (Rosemary) Extract. Massage a small amount of facial dream cream into clean, freshly-washed face. To maintain product freshness store in cool, dry place.